So for the second time today, I can report that the health of the creative industry in Hollywood is not as grave as everyone thinks. The financial condition I can't speak to, but when it comes to making an entertaining film, it seems they are not bankrupt yet. 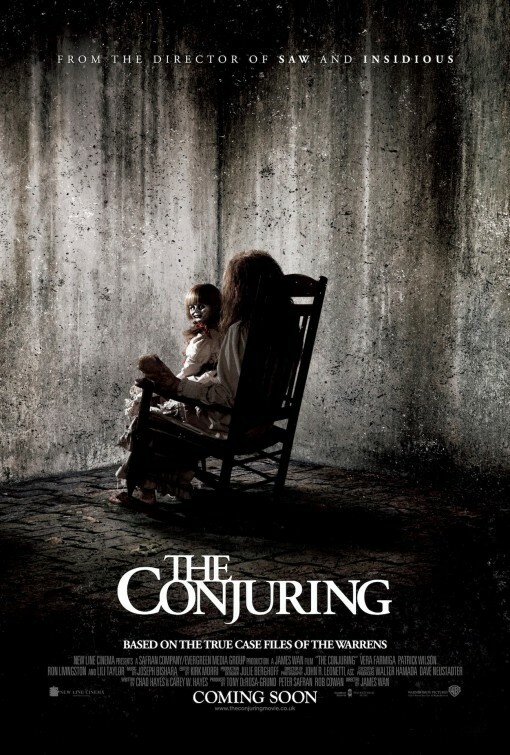 "The Conjuring" lives up to the hype I have been hearing about. It does not do anything really new when it comes to horror, but what it does is manage to sustain the suspense for the entitity of the movie instead of running out of gas halfway through. With a very minimum of CGI effects and a heavy dose of atmosphere, it delivers scares every time it tries to. This year marks the fortieth anniversary of "The Exorcist", a film that defines what horror really means. That movie created a real background for the characters that the events ultimately happen to, and the foreboding atmosphere exists before we even get to the the so called haunted house. In a similar way, "The Conjuring" starts off with a seemingly unrelated prologue. The creepiness factor is turned way up and the hair on the back of your neck stands up at just a couple of images, sounds and ideas. There is no great throwdown between good and evil , the explosive histrionics are saved for the climax of the main story, but we get a good idea of what is coming. A family moves into an old house that they have spent all of their money to get into. It doesn't take long for us to know something is wrong, because the dog wants nothing to do with the house. No big special effect, just a dog unwilling to go into a house and then barking most of the night. In the morning though, things get a lot more creepy a lot faster. The pace of the story is not rushed and although there are a few gotcha moments to go along with the tension, those moments are earned. There is a really great scene where one of the five girls living in the house experiences and sees something that no one else sees quite as clearly but all involved believe. The two sisters in that bedroom are frightened to pieces, and the film makers have the good sense to show us almost nothing. There are several other moments in the movie that work just as well and there is not an overuse of special effects. I can say that there was a very strong use of sound in one of the fright scenes and I think Sensurround could make a come back with this kind of sound design. This and PACIFIC RIM are my favorites for the summer. Yeah, it's not going to reinvent the Horror movie or anything, but it's so solid that it winds up being incredible, IMO. The scares are plentiful, but the dramatic element is solid as well. Nicely reviewed, buddy. I'm probably more enthusiastic on this one, but all of your qualifications are justified... Glad to hear you really liked it! I love it when other people whose opinions I respect agree with me. It is very self validating. Thanks guys for coming by and backing me up on this terrific horror film. Loved the movie and the performances of all. 2. The reflection sequences from the small toy. I thought these two segments made this film just that little bit more creepier than the normal horror film. There is no blood or gore in any of these sequences and they chilled me way more than the actual exorcism sequence. They were unnerving because the viewer saw very little. They hold true the "less is more" theory. Ron you picked out two good moments. I think there were a lot of them. Some were obvious but most were subtle. Thanks for coming by.